Towards the end of a busy Monday, I decided to watch TV before I retired last night. I managed to catch the last 40 minutes of a pretty interesting Hindi movie called Heroes (2008, Samir Karnik, starring Mithun Chakraborty, Salman Khan, Sunny Deol, Bobby Deol, Dino Morea and Preity Zinta). It is a powerful story of how the families of slain soldiers cope with their loss. Dr.Naqvi (played admirably by Mithun Chakraborty) refuses to forgive his son Sohail (Dino Morea) for joining the army – a decision that costs his Life. For years after his son’s death the doctor refuses to move on – he hates his son for not obeying him and so, over time, he becomes an irritable recluse. Meanwhile, the doctor’s wife has moved on. While she misses her son, she’s not grieving his death anymore. The fact that the wife has returned to a normal “happy” Life, while he is still unable to cope, causes the doctor greater agony and misery. Until, of course, his wife holds him a mirror and tells him that the cause for all his suffering is not his dead son – but his own refusal to move on. I found the story depict a very real situation that all of us often struggle with. Some Life events do numb us. They make us insensitive to the Life that is happening to us, around us. Our grief forces us to stay rooted in the past, in the event, suffering from the pain it has inflicted on us. Over time this grief, interestingly, becomes comforting. And to snap out of it requires an effort which we are unwilling to make. So, we wallow in this grief, ironically liking our own suffering! This is a deep-rooted, sub-conscious response to Life’s tragedies – to the death of a loved one, a failed relationship, a loss in business, a lay-off, a physically challenging health situation…to whatever blow that Life delivers to a “perfect” Life until then. When something gets taken away from you, after your shock and stupor subsides, remember that what is playing out is an unalterable law of Life. That law deals with the impermanence of everything and of Life itself. Be sure, whatever you have today, that which you call your own – your family, your kids, your money, your property, your job, your reputation, your Life – has to and will be, eventually, taken away from you. So, the most commonsensical response to a loss is to let go of the event that caused the loss and to move on. Moving on does not mean you are insensitive. Moving on means you are intelligent. It means knowing that clinging on to the past, to a loss, to grief, only makes you miserable. Whereas moving on, liberates you. It helps you experience inner peace and joy. Your memories may well come visiting, every once in a while, but they will not haunt you anymore! You suffer only when you wish that things were different from what they are. 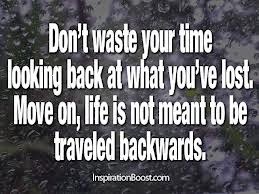 But with moving on you have accepted that your Life is what it is. That acceptance, through moving on, makes Life beautiful and worth living despiteall that you believe you have lost!